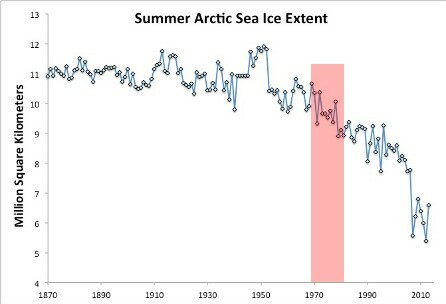 Note that he cleverly left off the huge increase since 2012, and the second graph shows a sharp decrease from 1970 to 1979, which is in direct contradiction to satellite data from the 1990 IPCC report – which showed a 2 million km² increase from 1974 to 1979. The EPA says that CO2 is toxic. The rise in CO2 of 1:10,000 since the year 1900 is equivalent to packing an extra eleven people into Michigan Stadium. I added those extra eleven people in green below. 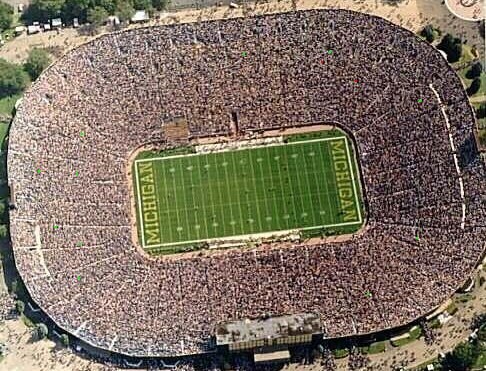 By contrast, human lungs generate 400 parts per 10,000 CO2, or an extra 4,400 people in the stadium. I added them in green below. One could easily come to the conclusion that the EPA has no idea what they are talking about. 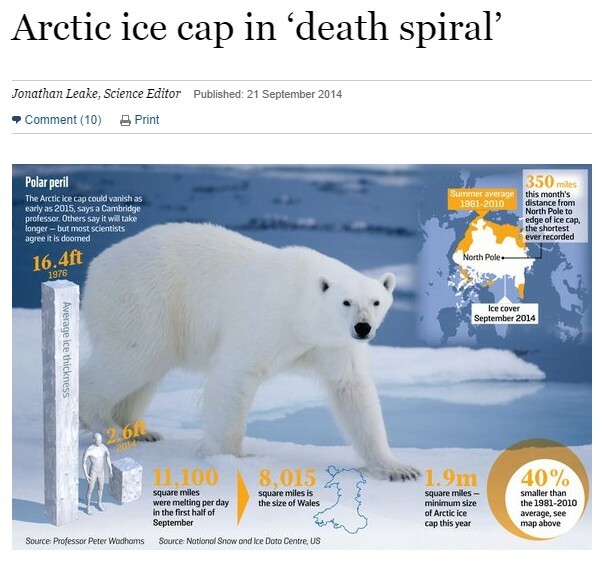 Let’s look at the fraudulent science one piece at a time. The amount of ice has increased by 60% since 2012, shown in green below. Scientists cherry picked one spot which lied along a boundary between high an low pressure system, where the winds blew persistently towards the pole all summer. 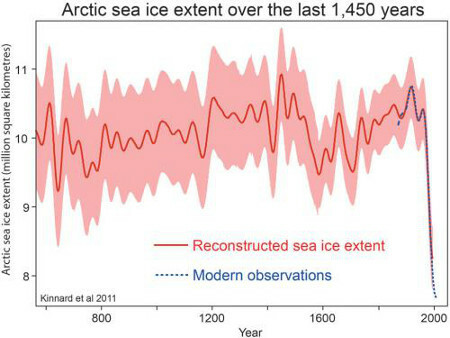 Most of the Arctic saw a huge expansion in ice. 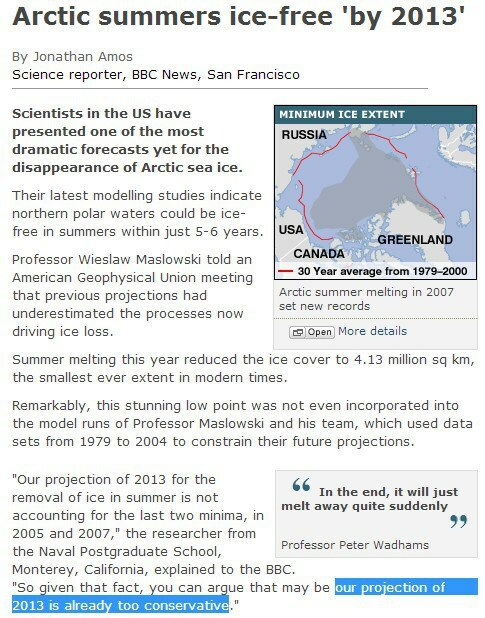 Next they quote Wadhams saying the Arctic will be ice free in 2015. His credibility melted away quite suddenly in 2013. On September 17, 2012 the extent of 30% concentration ice in the Arctic was 2.49 million km², and this year it was 4.09 km² on September 17. An increase of 64%. The past two years have been among the four highest of the past decade. 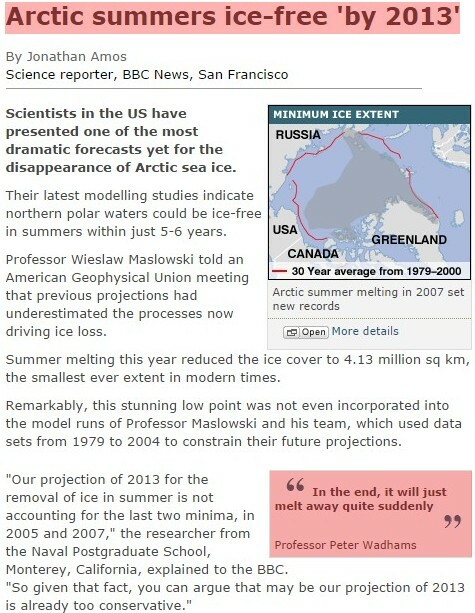 Experts say the Arctic has been ice free since 2013, or earlier – and that is is going to kill us all. Progressives normally blame the 1934 drought on farmers, saying that they caused the Dust Bowl. This is a fascinating theory, given that the 1934 drought covered 70% of the US, the Dust Bowl didn’t start until 1935, and it only covered a small area around the Oklahoma Panhandle. So other than having everything wrong temporally and spatially, progressives did find yet another way to blame productive people for providing them with an essential commodity. 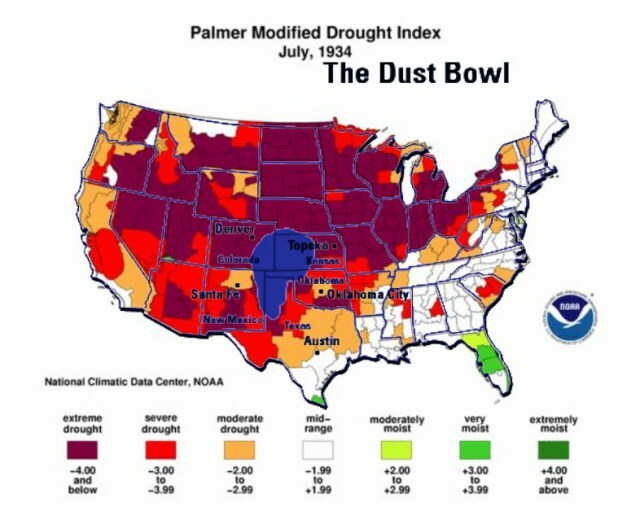 Eighty years ago, severe drought covered most of the US, but now covers less than 5% of the country. Experts say that drought is getting worse due to global warming, because their job depends on them lying.